As the Arctic sea ice melts, Greenpeace has released a new report on the Australian coal export boom, focusing on the Galilee Basin in Queensland, Australia. 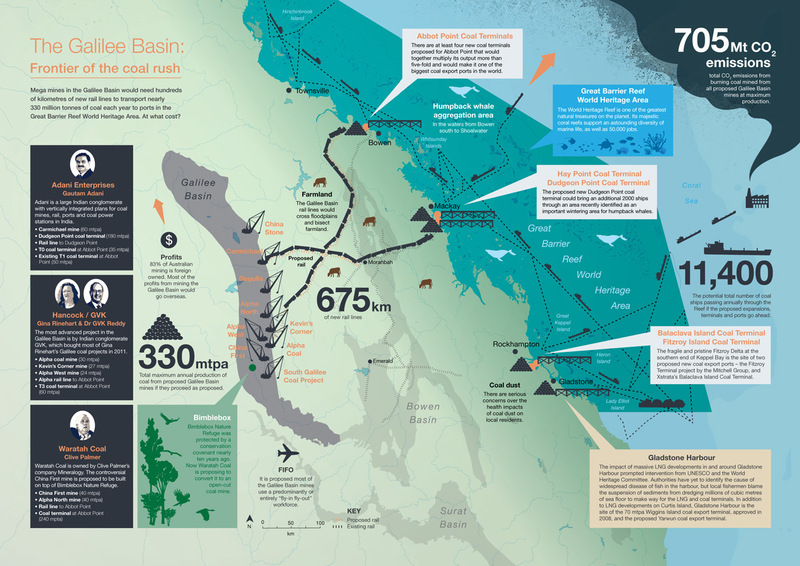 The report summarizes plans by coal companies to build nine “mega-mines” in the Galilee Basin for export. If these projects go ahead, the CO2 emissions from the burning of the exported coal will dwarf Australia’s domestic emissions. In addition to the climate impacts, they could also have massive local impacts. The Galilee Basin is just one of many regions around Australia where the coal and gas industries are expanding. In addition to the mines themselves, the coal companies plan to build rail lines and ports. There are at least two proposed rail lines from the Galilee Basin to the coast, one north to Abbot Point and one east to Hay Point. Meanwhile, there are a dozen proposed new coal export terminals along the Queensland coast, of which one is in the final stage of approval and seven are on track to be approved before the end of 2013. The most important ones are at Abbot Point and Hay Point, which would become two of the largest coal ports in the world. The total capacity of proposed coal export ports along the Queensland coast, again based on the industry’s own information, is far greater than the projected output from the Galilee Basin mines: over a billion tonnes of coal per year, or 2-3 billion tonnes of CO2 per year. The report argues the proposed Galilee Basin coal exports will only be in demand in a future in which governments take no action on climate change, and global warming reaches >6°C by 2100. Yet Australia has signed an international agreement to limit global warming to <2°C (a target which is itself nowhere near safe). The Government has completely ignored UNESCO’s call for a moratorium on new port developments in the Great Barrier Reef World Heritage Area. The state and federal governments are doing a Strategic Assessment of the environmental impact of Great Barrier Reef developments, but this will take time and the coal export boom is being allowed to proceed while it is undertaken. Under current policy, each mine and port is subject to an individual environmental assessment by the state and federal governments. Soon it will be only a state-level environmental assessment, as the federal government has promised to delegate its environmental protection powers to the states. Insanely, climate impacts are not considered because there is no “climate trigger” in environmental protection laws, and under UN accounting Australia is responsible only for emissions occurring within its own borders. The report notes that just because the Government currently has no policy to deal with fossil fuel export emissions does not mean the issue should not be addressed. Australia cannot continue to hide behind UN accounting. In the real world, where UN negotiations have not only failed to agree on an international regime of national emissions targets adding up to a safe global target, but have even agreed to delay such an agreement until it will be too late, Australia’s fossil fuel exports matter a great deal. Greenpeace recommends the Australian Government declare a moratorium on new coal mining and export projects, commission an independent analysis of the contribution of Australian coal exports to climate change, and develop a national policy framework to control coal export emissions. I support these recommendations.